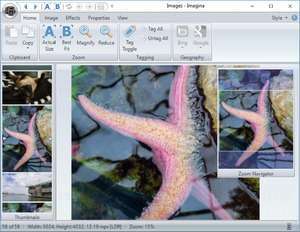 Imagina is an image viewer along with an image editor which can do several different things with your photographs. Imagina creates great-looking slideshows as a main feature and bills itself as a virtual lightbox. It works well with high definition images and keeps the thumbnails it creates as crisp looking as possible. Imagina specializes in many professional effects loved by amateur photographers; it has full support for undo/redo history, can intelligently resize images, take advantage of the dynamic range of your photos and control the exposure levels without making permanent changes to your image files. Version 1.9.16.0 is a freeware program which does not have restrictions and it's free so it doesn't cost anything. For security reasons, you should also check out the Imagina download at LO4D.com which includes virus and malware tests. Additional screenshots of this application download may be available, too.